I have completed this blanket more than a year ago, but I somehow never got round to sharing it with you. 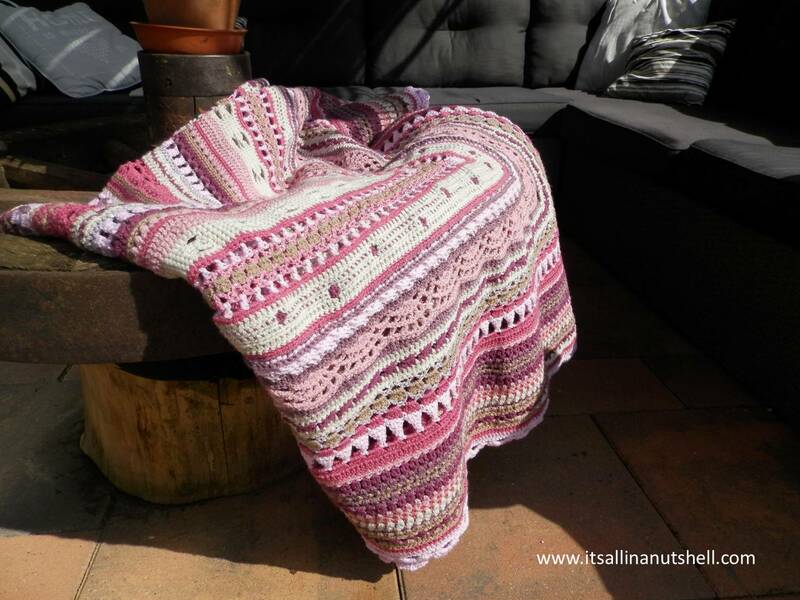 I am happy to show you my Dutch CAL 2015, a large single granny square blanket. I photographed this blanket when it was still summer, just shows how long she has been waiting for her final showing. For the Dutch CAL 2015 there were two center granny’s to choose from and from there it was adding many borders to make the granny grow to a double bed size blanket. My blanket is about 170cm square. I used Stylecraft Special DK in 6 colors and Schachenmayr Miracle in 3 colors with a 4mm hook to make my blanket. To my knowledge Schachenmayr Miracle is no longer available, but a good alternatives is Scheepjes Lizzy used double stranded to match the double knit weight of the Stylecraft Special. Stylecraft Special DK and Scheepjes Lizzy are available from Wool Warehouse or your local yarn shop. From the Stylecraft Special DK I used 4 x Clematis, 3 x Parchment, 3 x Plum, 3 x Raspberry, 2 x Mocca, 2 x Pale Rose, 2 x Grape. From the Schachenmayr Miracle I used 1 x Gold, 1 x Pink, 1 x Lila. I kept track of which yarn and color I used when, you can find all the info in my Color Chart Dutch CAL 2015. The pink and purple shades work well together and it turned out lovely. It is a lovely blanket, but I must confess; I have too many blankets and I need to make room in my house. For this reason my Dutch CAL 2015 blanket is now for sale in my Etsy shop (SOLD). I didn’t post very regularly about this project, only two posts actually. I posted when I was at 14 weeks and at 21 weeks. All the steps in between I did behind the scenes. Do you also have finished projects that you somehow forgot or didn’t get round to to sharing with the world? If you want to you can share them with me on my Facebook page or tag me in one of your post on Instagram. You can also use #itsallinanutshell to help me find it. Hoi Esther, het is een mooierd geworden!!! Je kleurtjes vind ik prachtig en dank je voor het linken van de patronen. May I ask which hook size did you use? Thanks. And the blanket is beautiful.